22 Winston Churchill Leadership Quotes That Will Lead You To Success - Motivate Amaze Be GREAT: The Motivation and Inspiration for Self-Improvement you need! 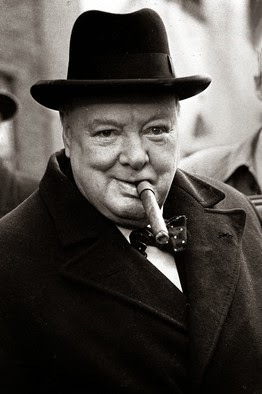 Winston Churchill was the Prime Minister of the United Kingdom twice and is widely know for his work by the time Second World War hit Europe. He is regarded has one of the greatest leaders of all time. In a time where war and Nazi terror shocked the world, he was one of the men who stood up for the people and helped the Allies win World War 2. He left a legacy of what good leadership his all about, we bring you some of his best quotes told in his lifetime. 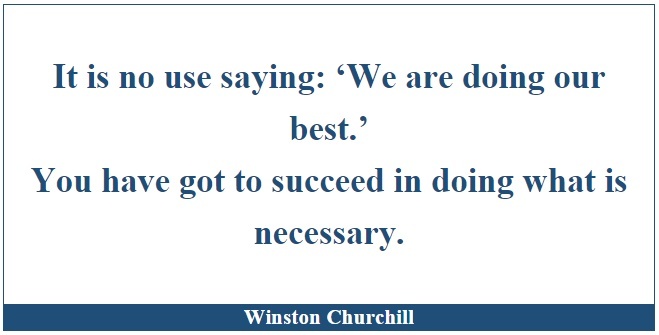 We've selected 22 leadership quotes from Churchill. The meaning behind this leadership quote: Quite often you witness this in your daily life, someone you know who isn't the brightest, is doing better than those who are recognized as being the smartest. That's because success isn't about knowledge, is about applying that knowledge in a continuous and persistent way. So it's not a matter of being smart or having the necessary skill, it's a matter of having the heart and the indomitable will. The meaning behind this leadership quote: To be a great leader you've got to have the capability of influencing people, in a way that people don't realize you're influencing them. You do this by searching for a way to fill their needs, but also, your needs. Sometimes they are the opposite, nevertheless you can manage to do this if you develop the necessary "tact" for each situation. "Tact" in a sense that you can handle the situation with the necessary sensitivity an solve a difficult issue. The meaning behind this leadership quote: You see people on TV in their "15 minutes of fame" but you don't see the years it took them to get there. Don't believe the hype, becoming a great leader, that seems to say the right things at the right time, it's not an overnight thing. It requires lots of hard work trough time to become that person, doing the work that only you can see. Character developed in the small moments will shine in the great ones. The meaning behind this leadership quote: You write your own life story, if you are really great doing it you can make History. Cause, a leader is a person who controls his/her destiny in such way that he/she has the power to make an impact in other people lives. The meaning behind this leadership quote: One of two things drives your life: fear or courage. Living in fear will prevent you from achieving, on the contrary, living in courage will get you to achieve all things. So, courage it's what starts the engine, where you go or at what speed you go, you decide after it. But if you don't start, you won't go anywhere. The meaning behind this leadership quote: Leaders are open minded persons. Being a fanatic is not being a leader. Leaders take the time to listen, take the time to learn from errors, so they can become better and make people better. If you want to lead people, you have to listen to them. The meaning behind this leadership quote: After hell comes paradise. Going through hell here is figurative, it represents the struggle. You're fighting for something, if you give up nothing will happen, but, if you keep going when it's hard, you'll achieving something. Probably, something great, because great things require great effort. As a leader you are the example for others, the best way to influence people is by example, so keep going so others you lead can keep going also. The meaning behind this leadership quote: You can't please everybody. As a leader you have to make decisions that some will like, others will criticize in a negative way. It's necessary to make those decisions, some people that you didn't pleased will dislike you, that's the human nature. But, it's better to make a decision and make the world change, than to try to please everyone and get nothing. The meaning behind this leadership quote: Life isn't easy, we don't have to make more complex than it really is. Too much regulations take freedom away and people feel imprisoned. That's when riots and revolutions occur. As a leader you should be in control, but don't be a control freak creating to much non-sense rules. Make tasks simple for people, and people will be on your side. The meaning behind this leadership quote: The best of both worlds that are hard to put together, but a great leader should master. You're not a leader because you give orders to people and they follow because it's their obligation, that's a boss. You're a leader because you give those orders but people are motivated to follow you and have a genuine interest on solving your problems. To do that you have to know how to communicate with people, like Churchill says: long enough for people to understand what you want, but short enough for people to be interested in doing it. The meaning behind this leadership quote: Before you did it, you thought you couldn't do it. After you done it, you see more to it. That's what you get if you're diligent with your tasks, getting out of your comfort zone and facing challenges. You get numerous rewards. One of them is a chain effect reaction where you get more opportunities to succeed. The meaning behind this leadership quote: You need to check for the results in order to make the necessary adjustments to your strategy. When you planed your strategy you didn't knew everything you needed to know about that issue, because you were on the conception phase. You can only get more knowledge when you go to the next phase, the execution phase, when you take the necessary action, putting your strategy into practice. That's when you can realize something you've planned might not be working, so although you've planned almost perfectly, you need to look at the results time to time for the strategy really to work. The meaning behind this leadership quote: You thought great leadership is only made of great thoughts and intellectual philosophies? 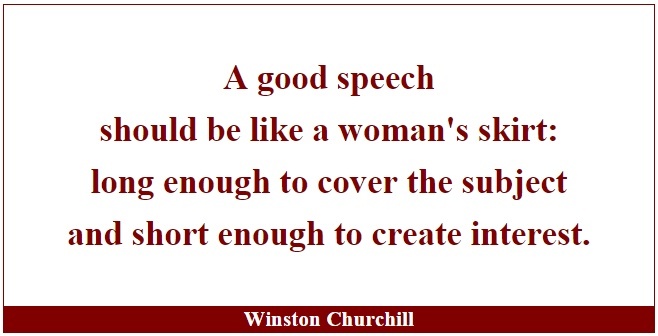 Think again, this quote is a great example of what leaders should be made of, first and foremost. The ability to work hard, to show to people how it's done. Other thing about this quote, is that anyone in this world can offer his blood, toil, tears and sweat, it's just a matter of putting your mind to it. The meaning behind this leadership quote: Critics love to talk, you've got to have a great capability to focus on your goals, despite what others might say. If you take the time to listen, you lose focus, you won't reach your goal. Your focus should be like a missile, that will only stop when he reaches his target. The meaning behind this leadership quote: One of the most known Churchill quotes, this is about people's approach to life. It's not what happens to you, it's the way you deal with what happens to you that determines the results you get. You can have the same situation happening to two different people, but one is able to be successful the other isn't. Sound familiar? Why? Because the first one look at the whole situation from a optimistic perspective, the second one from a negative. Your thoughts generate your actions, not circumstances. The meaning behind this leadership quote: Courage is not all about being very energetic and all over the place. It's a quality that makes you do the things people who are afraid won't do. The necessary things to achieve, if that means to stand up and speak do it, if that means sit down and listen, do it! The meaning behind this leadership quote: Success isn't easy, there will be times when if you feel you're doing "everything" necessary to succeed. But there's no such thing as "everything", there is always some thing you aren't doing, and that same thing can be the thing you need to succeed. Search for it, stay sharp make the necessary adjustments. The meaning behind this leadership quote: Anyone can improve, anyone can change. But to improve constantly and to change constantly is a requirement to get to the next level. Don't stop just because you feel a little growth, keep on improving so you can get, everlasting growth. The meaning behind this leadership quote: We've told you before, success comes to those who keep on going despite all adversity. Successful people are the one who learn from mistakes, so in essence they fail their way to success. They try, fail, adjust, try again wiser, fail again, adjust again, try again wiser, until they eventually reach success. Keep on going, be accurate about the adjustments you make to your strategy. The meaning behind this leadership quote: Leaders are constantly on the move, because they value time. You don't have forever to make a change, the clock keeps ticking. It's easy to relax and let time pass, but that won't change nothing. The best way to use time is to continuously do it with full effort and courage. Jobs once said "Good artists copy, great artist steal". Anyone in this world can have one idea you don't have, but you can have the capacity to apply that idea better than them. Take advantage of this situations in a positive way, like an inventor that as all the skills to invent, but no skills to sell. You have those selling skills? Make a deal with the inventor to market and sell their product. The meaning behind this leadership quote: First sentence is about surviving, you need to make living doing something, you get a job to get money to survive. Second, is about the power we have of transforming life by giving to others. It's on this second level leaders should focus on. To make a change on other people's lives by giving.